To coincide with the launch of the UN Secretary-General’s Education First initiative, the Education for All Global Monitoring Report Team will launch a new interactive website tomorrow – the World Inequality Database on Education (WIDE). In an exclusive preview for this blog, the Report’s director Pauline Rose explains what WIDE shows and why it is important. I am delighted that the UN Secretary-General is putting Education First by launching his new initiative for education. Three years before the Education for All deadline, it is a much needed push to get more children into school and ensure they learn – especially for the poor and marginalized. In order to design policies to reach the marginalized, it is vital to know who they are and where they live. But measuring marginalization is not an easy task. National averages of indicators such as average years in school often hide the problems of those at the margins. 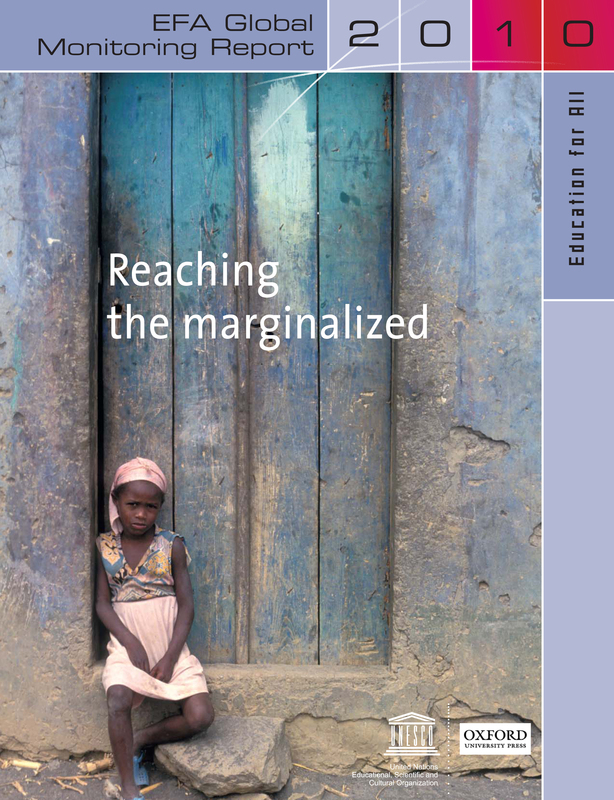 The 2010 EFA Global Monitoring Report, Reaching the marginalized, took a big step forward in providing new analysis that allowed us to look beyond the averages, showing how disadvantages, such as poverty, gender or rural residence, often overlap leaving large groups of children and young people with less than four years of schooling – which the Report identified as living in education poverty; and some even with less than two years of schooling – living in extreme education poverty. It gave world leaders, policymakers and the media unprecedented insight into disparities in access to education within countries. On the occasion of the UN Secretary-General’s initiative, the EFA Global Monitoring Report will publish the data presented on a new interactive website called the World Inequality Database on Education (WIDE) – available at http://www.education-inequalities.org. The website, which provides updated analysis for over 50 countries, allows you to zoom in on selected countries and indicators, compare disparities across countries, and identify which groups are most disadvantaged within these countries. WIDE paints an overall picture showing that much remains to be done to make access to education more equitable. For example, there are over 20 countries where at least one in five children have never even been to school. In as many as 24 countries, more than a quarter of young people have completed fewer than four years of education – and so are living in education poverty. As the 2012 EFA Global Monitoring Report will discuss, these young people will lack many of the skills needed to get a good job. The report will be launched on October 16. WIDE provides vivid visualizations that enable you to look beyond the averages. You can, for example, compare in detail how countries’ performance has changed over time. Looking at Cambodia, you will find that while the average years of education increased by more than two years for 17-22 year olds over a decade, the gap between the richest and poorest in the country has remained constant throughout the period. Cambodia, 2000-2010, 17-22 year olds. Average years in school. 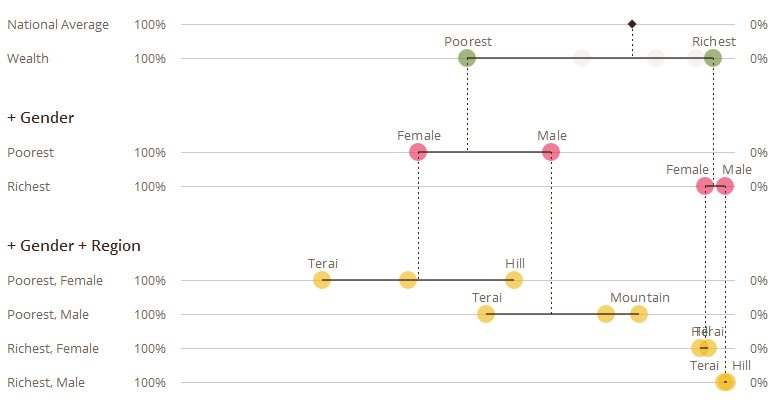 WIDE also lets you contrast countries with similar averages, but different levels of inequality. While Burundi and Sierra Leone have the same percentage of 17-22 year olds with less than four years of education, the gap between the rich and poor is almost twice as large in the latter. In Sierra Leone 72% of the poorest children had spent fewer than four years in school, compared with only 15% of the richest children. In Burundi, 60% of the poorest had spent fewer than four years in school compared to 25% of the richest. You can also compare how different factors – such as gender, wealth and region – matter for people’s chances of getting an education within a country. In Nepal, for example, WIDE reveals that while 19% of 17-22 year olds have fewer than four years in school, the percentage rises to 24% for women, 57% for the poorest women and jumps to 75% for the poorest women living in the lowland Terai region. By contrast, only 5% of the richest females in this region had fewer than four years of education. Here at the EFA Global Monitoring Report, we know that statistics matter. Rigorous facts are paramount for persuading policymakers that change is needed. We have seen how our Reports and data can help to influence change. In Pakistan, for example, the data presented in our Report on Reaching the Marginalized heavily influenced the country’s 2011 Education Emergency Report. The Report highlighted the gulf between the national average of educational attainment for the poorest in the country, and for those living in the province with the worst educational deprivation – Balochistan. In Balochistan in 2007, 45% suffered from extreme education poverty, compared with 25% in the wealthier province, Punjab. 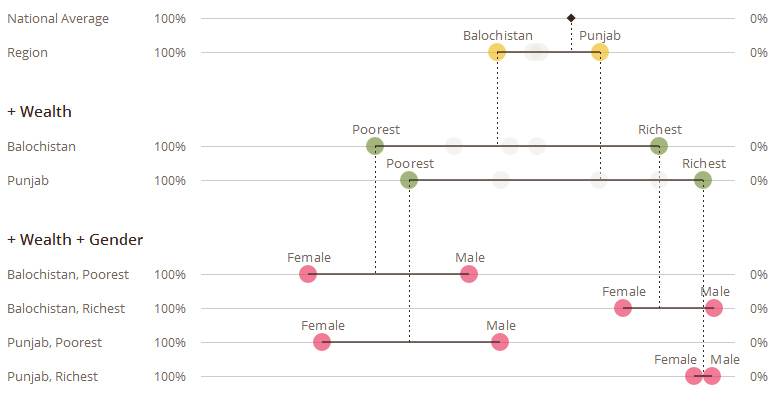 Yet vast gender gaps are evident for the poorest in both of these provinces, leaving poor, young women in Punjab with a similar chance of reaching two years of schooling to those in Balochistan: in both provinces, around 80% are in extreme education poverty. However, there is still a need for more and better data to identify the groups most deprived of education in different societies. With the deadline for the six Education for All goals closing in, the world is unlikely to meet the goals. An important reason for this failure is that not enough attention has been given to those who are marginalized. Education goals set after 2015 must include equity-based targets. Improving available data for measuring marginalization in education should therefore remain a high priority for the post 2015 agenda. For now, our hope is that WIDE will make a visual impact highlighting the extent of disadvantage that policymakers can no longer ignore. From governments to activists, you can use WIDE to identify the problems countries are facing in promoting equitable access to education, and act on that information to promote Education for All. This entry was posted in Basic education, Developed countries, Developing countries, Equality, Equity, Marginalization, Poverty, Primary school. Bookmark the permalink. Since children with disabilities constitute one third of all out of school children, can we assume that they will be distinctly identified in the data on THIS occassion at least? Although children with disabilities are -once again -invisible in this report, they are most likely to be in the ‘never been to school’ group, if they have been counted at all. The most recent UNESCO/UNICEF report for Rio+20 identified a group of children described by their governments as ‘unlikely ever to go school’. These children now need to be identified because Education for All must not be allowed to become Education for Some. No child is ineducable and any country denying the right to education is in breach of UN Conventions of the Rights of the Child and of Persons with Disabilities. Some of the poorest countries in the world (eg Lesotho) have shown that children with disabilities can benefit from primary education. But it needs political will, targeted resources and public support. Many thanks for your comments, and highlighting a key issue which is certainly of paramount concern. As our blog mentions, there is still a need for more and better data to identify the groups most deprived of education in different societies. One of these groups is certainly children with disabilities. The datasets that we can analyse for the purposes of identifying disadvantages across countries unfortunately do not provide information that allows us to undertake the analysis which you very rightly ask for. The Report is not able to collect its own data but is reliant on data sources from international sources – and we fully support your campaign to ensure we have the data that allows us not only to identify reliable numbers of those with disabilities amongst the most disadvantaged in education, but also the ways in which different types of impairment impact on education opportunities. I was disappointed but not surprised to find that the 2012 GMR runs true to form by once again making hardly any reference to disabled children or to their exclusion from education and hence from vocational education or employment. This is in contrast to the 2011 WHO-World Bank Global Report on Disabilty which has well-documented chapters and recommendations on education and employment and documents examples of ways in which obstacles to access have been surmounted. It is sad that UNESCO which has in the past provided world leadership in the development of inclusive education for disabled children now lags so far behind other UN organisations in promoting and protecting the human rights of disabled people and continues to discriminate against them by its silence on their needs and achievements. UNESCO has for some decades reported that only two per cent of disabled children ever went to school in low and middle income countries. This is consistent with the estimate that they now constitute one third of the world’s out of school children. Lack of data did not stop some low income countries from opening their schools to children with disabilities -eg Lesotho,Lao PDR, Vietnam, Uganda and Kenya. It is just unacceptable that some governments are now supplying UNESCO with data about the number of children ‘never expected to go to school’. Governments with millions of out of school children need technical and NGO support in ensuring that disabled children are not -once again excluded. Thanks for your comment on our blog and offer to guest blog for us. We already have a couple of series arranged for the summer with a set of guest bloggers, so don’t have much time for extra additions at the moment I’m afraid. However we welcome you to continue writing comments on the blogs as it’s a great way to get discussions started if you have contributions you’d like to make. If there is something further down the line that you have a particularly specialist knowledge in then please don’t hesitate to get in touch again though.